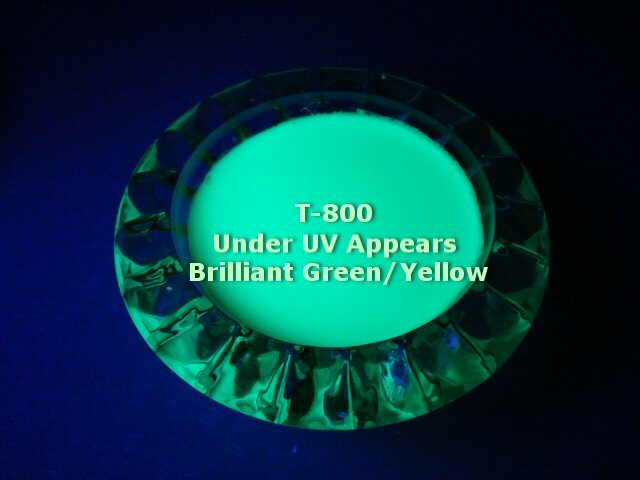 Commercial Use For Security Marking & Quality Control, Special Optical Effects With Fluorescent Brilliance. Not intended for non porous/hard surface marking. This product is water based. 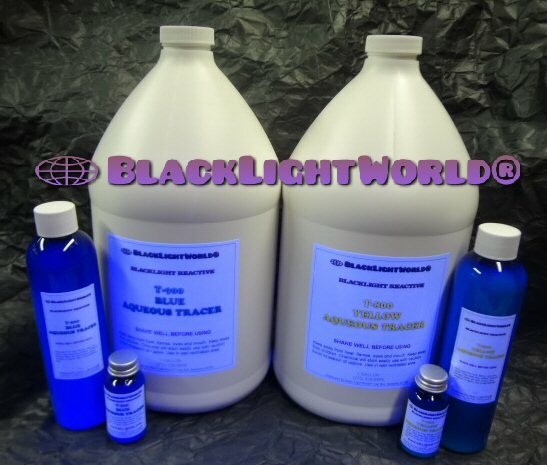 For permanent marking use our Neon Blue Invisible Marking Ink Powder. Please sample this product in our 1 oz size for suitability. Non returnable product. These are Aqueous Tracers AKA Dispersions that are usually used to mark paper. 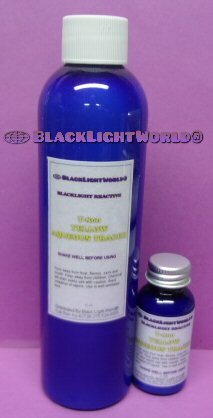 The dispersions are suspended in water and suitable for use in water based inks & coatings. 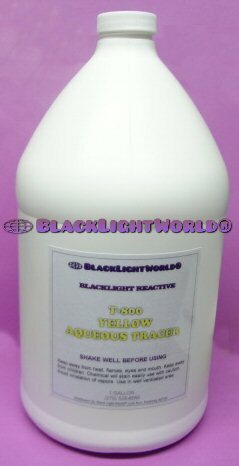 Also popular in creating visually brilliant special effects when standard long wave black light is applied. 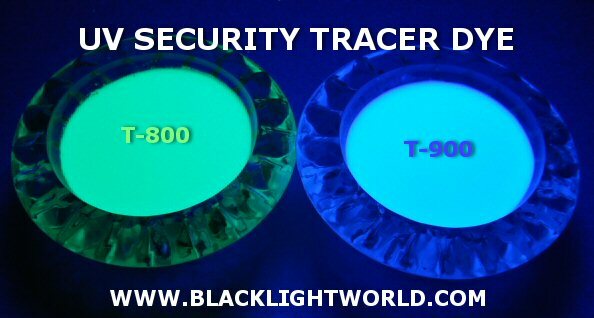 Tracer T-800-900 series are invisible in daylight and fluoresces blue or yellow under black light. 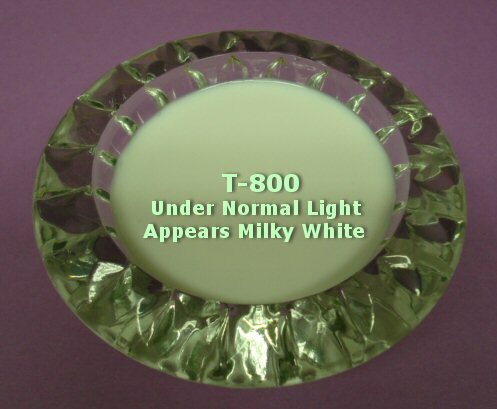 Normal color is milky white. We suggest that the Tracer be diluted by using one part of tracer to ten parts of clean water. The mixture is usually applied to the paper using an automatic spray device, but can be applied by hand using a paint brush or an even smaller marking tool. It can also be loaded into a shipping room marker (a smaller refillable felt tip marker). If white paper is being marked, the 10 to 1 dilution may be too concentrated and the tracer will leave a visible mark. Dilute further until no visible residue can be seen. The mark is then observed using a black light (a filtered long wave ultraviolet light). The mark can best be seen under subdued ambient lighting conditions - not in bright sunlight. After experience with a particular marking application, the dilution ratio can be often increased. We have some applications where a ratio of 25 to one can be used. Invisible marking means the application of fluorescent materials that cannot be easily seen in normal daylight, but become visible when exposed to a beam of long wave ultraviolet light that is sufficiency intense to cause visible fluorescence to appear on the marked article. Observations and automatic scanning work best with subdued visible ambient lighting. Users select invisible marking because they do not want the mark to be seen for appearance reasons or they do not wish knowledge about the marking to be easily discernible. Invisible marking is often used for product ownership or source identification. It can also be used to guide manual operations as in garment fabrication using black light to guide cutting and sewing. Invisible marking is often used where marks need to be placed on multicolored surfaces that make automated scanning difficult because light from the background prevents a clear signal from being received by the scanner. The purpose of scanning is for automation. The scanner verifies that an invisible mark is either absent or present and causes some action to be taken based on the signal. The action taken obviously depends on the application, but could take the form of sending a product on a selected path in a conveyor system or to trigger a subsequent processing operation. 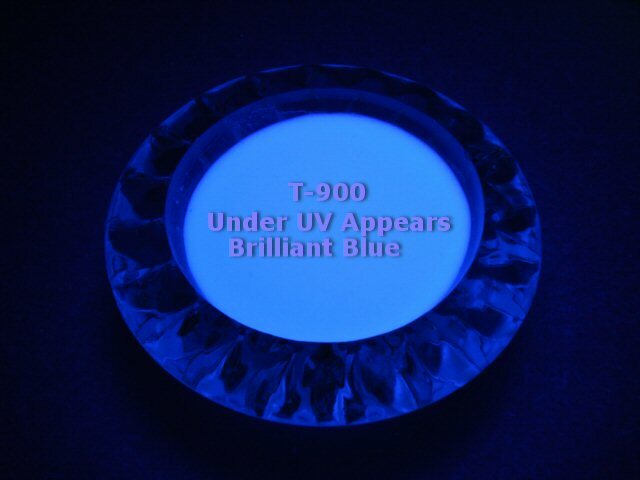 In any coating operation where the coating film is invisible to the naked eye, uniformity of the film or conversely, the lack of uniformity, can be more easily detected by adding fluorescent tracers to the coating medium and then inspecting the coatings under black light. 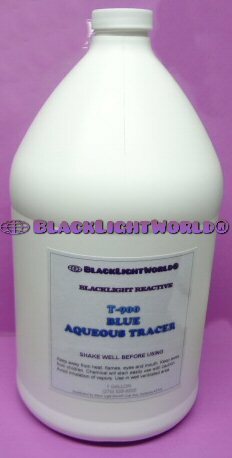 Fluorescent tracer products, using this general method to detect unwanted residues, have found application in the removal of solder flux containing a fluorescent tracer from circuit boards after soldering and cleaning. 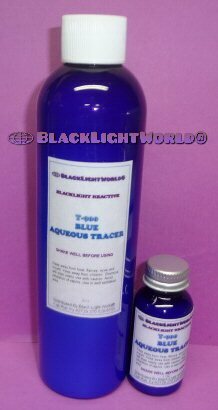 Another fluorescent tracer is often added to the final conformal coating for a further inspection under black light to assure thorough and even coverage. This general approach to coating inspection can be applied to many quality control procedures involving electrical devices such as potentiometers and transformers. A host of other uses are found in almost any field involving coatings and adhesives to verify either the uniform presence of a material or to detect absence of the material. Automatic scanning devices utilizing fluorescent tracers can be valuable in establishing automated procedures and improving record keeping capabilities in quality control inspection. Ever hear the saying? "You get what you pay for"? We sell the highest quality tracer dyes! Items which are non returnable are Pigment Powders, Invisible Ink Pens, & all Paint which is made to order, and ANY Liquid Products. WE HIGHLY RECOMMEND SAMPLING PRODUCTS IN OUR SMALLEST SIZES BEFORE MAKING LARGER PURCHASES FOR FULL SATISFACTION OF THE PRODUCT(S). Other Large Purchase Returns Are Subject To A 25% Restock Fee. Sample our products prior to large orders!